Earn $25.08 in VIP credit (2508 points)What's This? 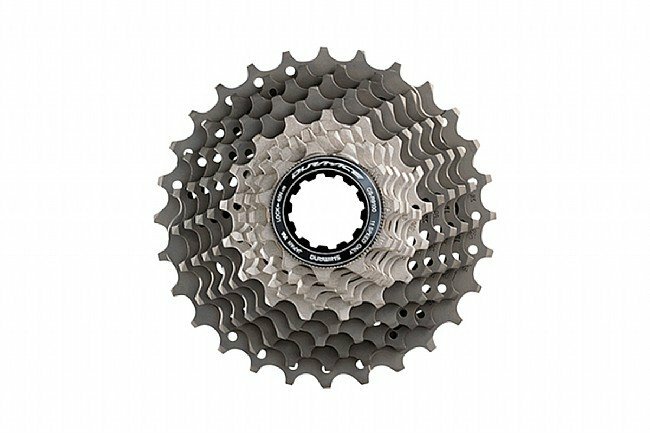 The Shimano Dura Ace CS-9100 11-Speed Cassette features titanium construction on the five largest sprockets and a carbon composite / alloy spider for high-performance at a low weight. Hyperglide tooth profiles ensure precise, reliable shifting with the Shimano 11-speed chains, and the introduction of new 11-30 gearing option means the Dura Ace R9100 group is the most versatile yet. Claimed weight is 175 g (11-25 cassette). 30 cog is perfect for rolling terrain. Shimano What can i say!!!! I needed a second set for my trainer and wanted to match exactly my bike to keep change over time at a minimum. Good price and high quality.